Yesterday I got back from this year's Reading Festival. I was fortunate enough to get a volunteer spot on the bar through my university and, not gonna lie, this year was the best Reading Festival yet! I managed to put dead batteries in my camera for day 1 but managed to see Vampire Weekend, Paramore and Queens of the Stone Age. I may have had to run a good mile or so through the campsites to get to VW on time but it was so worth it - they are so fantastic live. I used to love Paramore when I was younger and thought I would check them out and was actually pleasantly surprised. They were much better live than I remembered and picked a lot of their old hits which is good for me! Oh, and QOTSA were fantastic. I'm not a fan but hey - they are so good at what they do! I was fortunate enough to get placed on one of the bars right by the main stage - I couldn't believe it! Early in the afternoon the bar was pretty empty so I pretty much saw all acts on the main stage over the weekend. I couldn't have asked for a better position. I got to see Jimmy Eat World (dancing and singing along of course), Deaf Havana, Jake Bugg, Arctic Monkeys, Imagine Dragons and Foster the People whilst I was working. Crazy! Okay, I could hear it whilst I was working but that's kind of the same right? Unfortunately, working every day meant that comfort took over fashion for me. I felt so boring wearing black skinnies (that I ripped myself the night before - cheeky!) and a vintage tee I picked up from Rokit but I had an 8 hour shift okay? I love my new tee though - it just goes with everything! Day 3 was 100% the best day of the weekend. I had my last shift, saw Saint Raymond, The Kooks, You Me At Six, The 1975, Mayday Parade and of course Blink-182. A good line-up and great company - what could go wrong?! We popped into the silent disco at the end of the evening because Frank Turner was doing a DJ set and danced away until the early hours of the morning. It was such a lovely way to end Reading - even if I was absolutely exhausted! Now, I was super duper cheeky and managed to get myself backstage for Mayday Parade. I didn't get to meet them unfortunately (I rushed off to catch The 1975 for 20 minutes) but watched their set from the side of the stage which was crazy. I have only ever done that once (for The 1975 actually - weird) and it's crazy seeing the crowd in front of you. I had completely forgotten how much I'd loved Mayday - I have no idea how I still remember the words to all their songs! Reading - you were super lovely. Fantastic weather, brilliant bands and some great company. The best acts this weekend for me were Saint Raymond, The 1975, Jake Bugg and Vampire Weekend. I have totally rekindled my love for pop-punk though. I don't know why I stopped listening to Paramore and You Me At Six. You may be able to take girl away from pop-punk but you cannot take pop-punk away from the girl. 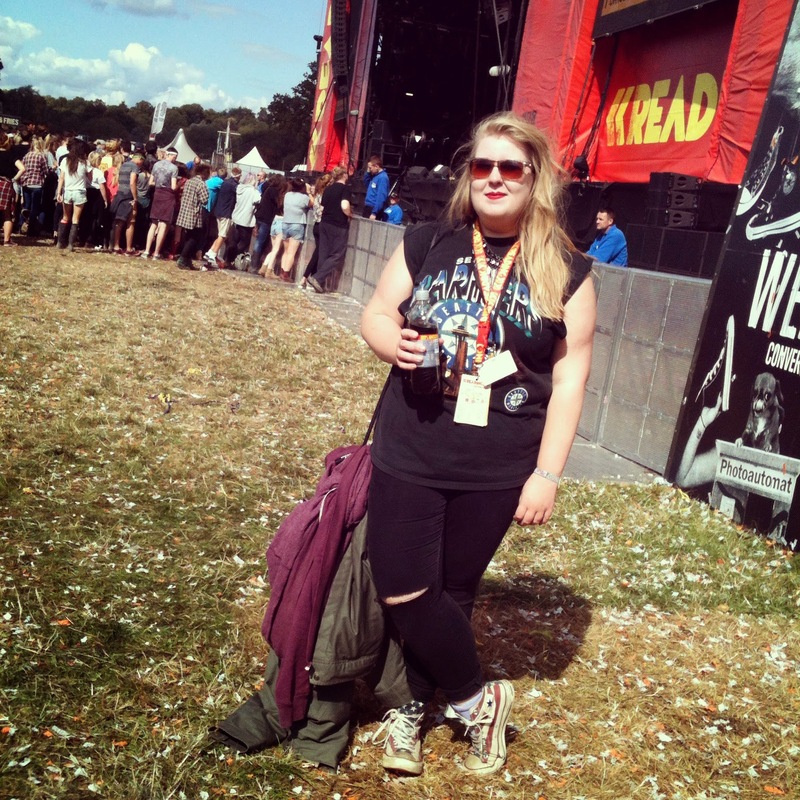 Did you go to Reading/Leeds this year? Let me know! This year was a really good line up. There was constantly someone on (unlike the other years I have been!) Definitely go see VW or The 1975 if you can - they are both amazing! Definitely see him if you can - I enjoyed his set so much! Ahh so jealous! I tried to watch as much of it as I could on TV, it looked so good this year, glad you had an amazing time! So lucky you were placed so close to the main stage, least you could work and not miss out on the music! I used to love Paramore, You Me At Six and Mayday Parade, never listen to them now but YMAS and Mayday Parade are amazing live, loved them when I saw them two years ago! I'm glad you had such a good time! I still really need to go to a festival, something I need to experience. It was so lucky! I had totally forgotten how much I still loved the bands I used to listen to when I was younger. You should definitely go to a festival - even if it's just for a day. It is such a good atmosphere! So jealous - really wanted to go to Reading as the lineup was so incredible, but funds didn't allow. I've volunteered at festivals before and had a really good time, definitely looking to do some more next year! It was so much fun volunteering. I had more fun this year than I have had before - crazy! I'd definitely do it again. You should definitely go if you ever have the chance! I've never been much of a festival person, I'd love to go and listen to the music and do all the fun stuff and then go home and sleep in my comfy bed and have a shower! Looks like you had a great time, and lucky you got to volunteer! I used to love Mayday Parade but haven't listened to them in years, might have to listen to them again and rekindle my love! I know what you mean! The camping is the worst bit. I was fortunately in a campsite with actual toilets this year so it was absolutely fine though thank God! You should so listen to Mayday right now - my old iPod has come out and all of my old favourites are on repeat. It's so nice! It look very fun! Wanna go there too! Wow what a great line-up. You were so lucky to get a position near the main stage. And about the fashion, Girl comfort has to come first when you're doing 8 hour shifts. That said you can never go wrong with a vintage tee and skinnies right? So lucky! It really made my weekend! I was going to wear a velvet skater skirt but gave in and wore jeans. I just wish I had some chelsea boots or something! woah that's so awesome you got vip seats through school! i wish i thought of that when i was back in college haha. i cant believe you were on stage, i'd be freaking oooout. I'm beyond jealous as I am a festival virgin, and I do think that if you do a festival Reading is the one!